My writing career started when my daughter decided to enroll in a graduate course in publishing. She needed to acquire a book so she asked me to write down my stories from my childhood. Growing up in a large, Irish Catholic, family many hilarious tales were shared as we sat around Grandma’s kitchen table. It was during the process of writing these stories for my daughter that I got the writing bug! I had never written as a ‘writer’ but always loved to tell a good story. I decided to hone my writing skills and take some courses in writing children’s literature. That is where it started; I haven’t been able to stop yet. I really wanted to be a famous actress like Audrey Hepburn, but I suffered from intense shyness as a youth so any kind of stage presence was not possible. I thought maybe a nurse, like Florence Nightingale, but I didn’t like blood. I loved to curl up with a good book and fly to different exotic lands and fall thorough a hole into ancient times like a genie. I wanted to be Nancy Drew and solve mysteries, instead I was content reading about them, and dreaming that I was Nancy, with my own convertible, a handsome father, and a boyfriend named Ned! Charley is the name of the protagonist and the novel is based on his true story, so it seemed only fitting that it should be named after him. I thought about possibly adding a subtitle, CHARLEY, The Boy Who Sings! But I thought that might take away from the clout of naming the book simply, CHARLEY. FIFTY CENTS AN HOUR, Or my Life According to Me was my first book and is my memoir. WHERE IS SIMON, SANDY? The Story of a Little Donkey that Wouldn’t Quit (Picture book). SATCHI AND LITTLE STAR is the story of a young island girl who tries to catch and tame a wild horse (Picture book). HURRICANE MIA is a middle grade adventure story set in the Caribbean. It is available as an e-book on Amazon and anywhere e-books are sold. CHARLEY is a middle grade historical novel based on a true story. My neighbor, Russell, who is in his high eighties, is Charley’s son. Once I discovered that his father was such an interesting character I pursued Russell to share his father’s stories with me. He dished them out piecemeal, in a phone call, a note in my mailbox, a quick visit to my door, etc… I worked on background research, setting the scene, writing my outline and fitting all the pieces of Charley’s puzzle into a novel. One evening Russell showed up at my doorstep. He took a square piece of tweed out of his pocket with a handwritten note pinned onto it, which read, “This is the coat Charley wore the night he came to Maine.” Russell held the square of tweed up to his forehead. He told me that if I got stuck, I could place it on my forehead and Charley would help me find the best path to take. I kept that swatch with me the whole time I wrote Charley, and yes, indeed, when I was uncertain about what Charley would do or say, I placed it on my forehead and the direction to take was loud and clear! WHICH AUTHOR HAS MOST GREATLY INFLUENCED YOUR WRITING STYLE?Betty Smith (A TREE GROWS IN BROOKLYN). I have deeply admired her writing style in this great piece of literature for young adults. Reading other authors of discerning styles helps a writer find their own voice, not by being a copy-cat, but rather injecting a strong dose of literature into our heart and mind. I felt reading, and rereading, A TREE GROWS IN BROOKLYN, not only inspired me to write great literature, but somehow, like osmosis, it helped give me the fortitude to write Charley’s story in my own words. children’s literature to date. Charley’s stories are in my heart. What makes Charley so special is not because he was famous like Abe Lincoln with hundreds of books written about him, but because he was a regular boy who lived and breathed over one hundred years ago. My first job when I came to Boston was as a childcare worker in a residential treatment home, New England Home for Little Wanderers. My role there was as a surrogate parent. We, the team, woke the children in the morning and in the evening, after reading a story, put them to bed at night. We ate breakfast, lunch and dinner with the children. We were the cookies and milk after school. We made their Halloween costumes, went sledding with them on freezing cold days; we were both Santa Claus and the Easter bunny. I knew first-hand what it was to love a child who didn’t have a home or family they could depend on. I knew what it was like to see a child allowed to be placed in a new home and others passed over due to legal technicalities. When I learned from Russell that Charley stayed in the very sameNew England Home for Little Wanderers, I knew right then and there I had to write his story! My award winning novel, CHARLEY, is my greatest accomplishment, a work straight from my heart. Winning the high honor of The Eloquent Quill Award from Literary Classic Book Awards makes it also my highest achievement. Writing is the easy part, getting published is a bear! It takes more perseverance than most of us have been endowed with. If you are willing to tackle the publishing world, first of all, you will need to grow the hide of a rhinoceros. That will toughen you up to make it through the long waits from query letters and manuscript submissions, and the rejections that come after exclusively holding your manuscript for 10 months, when they said it would only take three months. Before writing your manuscript It helps to do the research and look for what is needed out there and finding a niche that will place you above the massive amounts of writers hoping to get published. It is a hit or miss game. It helps to have an agent, I am told, but they are not so easy to acquire. I have published all my books through a small, albeit, very professional boutique publisher. They gave me all that I would get from a big publisher and even more personal attention, which is important, especially as an unknown or first time author. An extremely big plus is that I was able to work with my choice of illustrator and have a say in the illustrations. I was also involved in every aspect of producing and marketing of my books. Big or small, self published or traditional, you need to be foremost in promoting your book. If you have the budget you can hire a publicist. They know the contacts for book reviews and social media. It is important to send galleys out, the advanced reader copies, to get testimonials for the book. Reviews are extremely important, a publisher will help with this too, if you are self-published you need to find the persons most suitable to your work, many authors are willing to do reviews because they get publicity from your book. It is very important to have a niche or platform that you can work from. 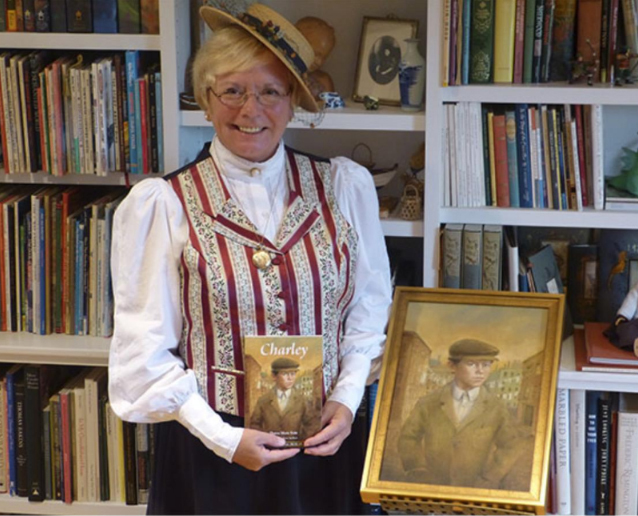 I launched CHARLEY in a living museum that highlighted the era of the story. The museum helped me plan the entire launch and their marketing person was terrific with publicity. It was in their favor to produce a successful launch for CHARLEY as well as mine. We had the local papers cover it with color photos and used social media in every way possible to spread the word. It was a great success and now Charley and I are very much at home at the museum, I am frequently invited to do book signings, author days and special visits. If writing is your passion, persevere! The joys are numerous! You will meet the most interesting people and the learning never ends. Writing is like life, an adventure! DO YOU HAVE ANY NEW BOOKS IN THE WORKS? : My next book will be launched in 2016. It is an armchair travel book of my husband’s and my safari in Tanzania. My husband, Martin Seim, photographer extraordinaire, has captured both the richness of the people and the incredible wild life in Tanzania and the spice island of Zanzibar. The title is ASANTE SANA, TANZANIA, which means Thank you very much Tanzania, in Swahili!